Cottonseed prices still best in wall? I come through Rowena as well. Who has the best corn prices at the moment? I leased several thousand acres on the west side of 1223 off Marathon Oil Co Road for about 12 years in the 80-90s. That Susan’s Peak area was some of the best hunting I’ve ever been involved in. Smart bought it all up and is currently offering a TBH bro discount of $500 ton plus delivery. Turkeys were out this weekend despite the hurricane winds. We were able to get it done! **** good looking bird!... is that picture altered with a jzoch filter because that is a beautiful bird if that is natural. Reminds me of a light bronze gobbler my grandmother chased with a fury and mounted. Hahaha it actually had a lot of color, I just lightened the picture. Fun hunt. Had my little one with us when we filmed it. you won't be far from me. I will be living off Walling Pecan if you ever need anything don't hesitate to pm me! Good Luck, I have seen some monsters out there. The Rocking Chair has some monsters. I don't know how close you are to them but the potential is there! Daaaang . Great bird either way! Had a great 3 day weekend and got a lot of work done in NW Schleicher Co.
Bowsticker and AntlerCollector helped me move a stand I acquired from another lease member to my old set up. THANKS GUYS!! Put out 2 new cameras, pulled and replaced batteries and sd card on another, did a little maintenance and clean up to my trailer and camp area, ate some good food, shared a campfire with some even better folks and drank an adult beverage...or 2. Overall it was a very productive but tiresome weekend for an old man. Hardly a hitch..........other than my son and I having to save camp from burning down after a totally careless and negligent act by a lease mate, who shall remain nameless at this time. Glad to help get you set up RascalArms! It was a good work weekend at the lease. Yep it's dry as I've seen it out our way, be very careful with the hot stuff! I believe my brother and I built that double barrel feeder, how funny is that. Praying we all get some rain soon. It’s really dry out our way. You want to be reunited with it again? Just let me know...I’ll make you a helluva deal on it! haha, no thanks...that sucker was a pain to fill up! Assuming you bought it from RRagan83? Helluva work weekend. Glad you got it all done. You and your poor son were prob sore Monday morning..
All the comedians are out I see today. The besties are teaming up on me I guess? I’m gonna need one of you slackers to go fill my bulk protein feeders. Trade you some stinking turkeys! I can’t seem to make it out there. If I wasn't 5 hours away, I'd take you up on that offer..
Got 1200 lbs of peas and a ton of protein put out today. Bone dry at our place. Sure not looking good so far. Deer are hammering the feeders. Same way out in our pasture...It’s scary dry!!!!! The paint on a couple of these protein feeders has been bad since year one. Started rattle caning a couple. Had a couple cans left over from another project. Really should have rolled these. Had the professional hunters with me. I agree with the rolling on something you want to last. That spray could be your primer..
Good stuff with the Daisy BB gun armada wreaking havoc on your small game..
Up north of Angelo and the birds are quiet. Haven’t gotten a gobble all day. Found plenty of hens but only seen one Tom. Last edited by El General; 04-28-2018 at 06:58 PM. Your right we need rain really bad. We were out a couple weeks ago and it looked like January. Enjoyed the visit. Sure praying for some good rain soon. Maybe we will get some next week. 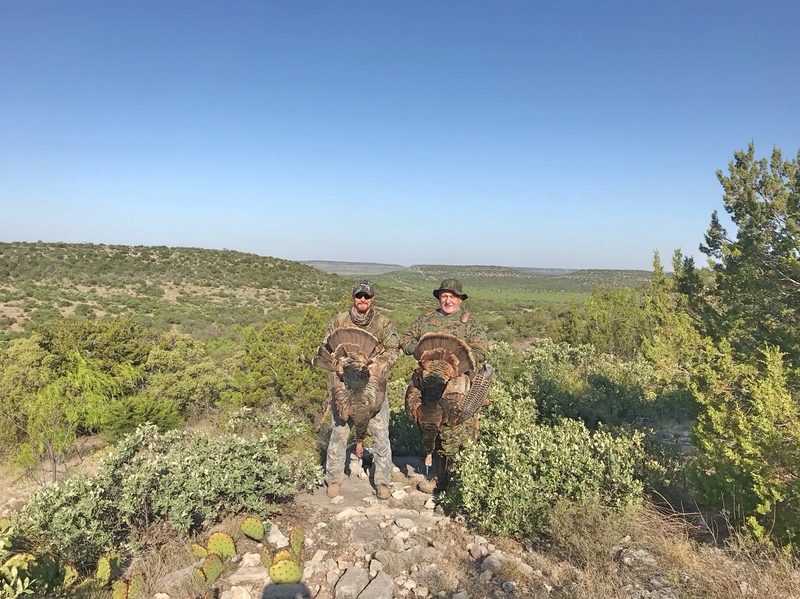 Turkeys were hammering back once again out West. Got my buddy on his first big chicken. Came in gobbling on a rope full strut. As said need rain bad, it's gettin ugly out there. Nice! Congrats on the long beard! Great weekend with the guys. Had my other PM come down with his Dad Who flew in from North Carolina and got them on some Texas Rios. After 25 years his dad completed his turkey grand slam. Glad it all came together and happy to have helped someone along the way. I guess it was just us. Turkeys weren't talking much (heard 3 gobbles all weekend) and definitely weren't answering us. We don't know what we are doing though. Looks like most of our area got some or is getting some much needed rain!! Thank you Lord! Last edited by Smart; 05-03-2018 at 06:48 AM. Raining good now in God’s country! That's awesome! Thank you Lord! Happiness is wet deer and turkey feet... although what little was left of my cottonseed is spread out over 50-60 yards I bet . No more easy meals till I refill next weekend.